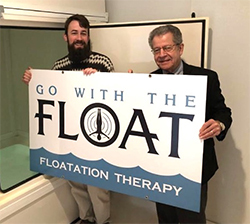 MSBDC client Stephen Bryla, owner of Go With the Float [photo left], was born and raised in the Pioneer Valley and studied psychology at UMass Amherst. In 2008, Stephen discovered float therapy and recognized the benefits it could have for physical and emotional healing. He realized this innovative technique was a potential business venture and a way to bring wellness to his community. Stephen started working with the MSBDC Western Regional Office in 2015, when he attended the Center's monthly Basics of Starting a Business workshop with Senior Business Advisor, Allen Kronick [photo right]. What is floating? Flotation therapy is a wellness practice which involves lying on your back in ten inches of water mixed with 1,100 pounds of epsom salt, causing the body to float. The environment is quiet and dark, leaving the brain free of outside stimuli and allowing for mental and physical healing and rejuvenation. Stephen and Allen met one-on-one throughout the business planning process and continue to meet regularly to address marketing strategies. In Bryla's words, "Allen has been instrumental in my journey from an idea to an operational business." Go With The Float launched in December 2018 at the Keystone Building in Easthampton.